Summer Reading is important and fun. 84% of kids ages 6-17, and 96% of parents agree that reading books during the summer helps them/their kids during the school year! Kids enjoy reading in the summer. 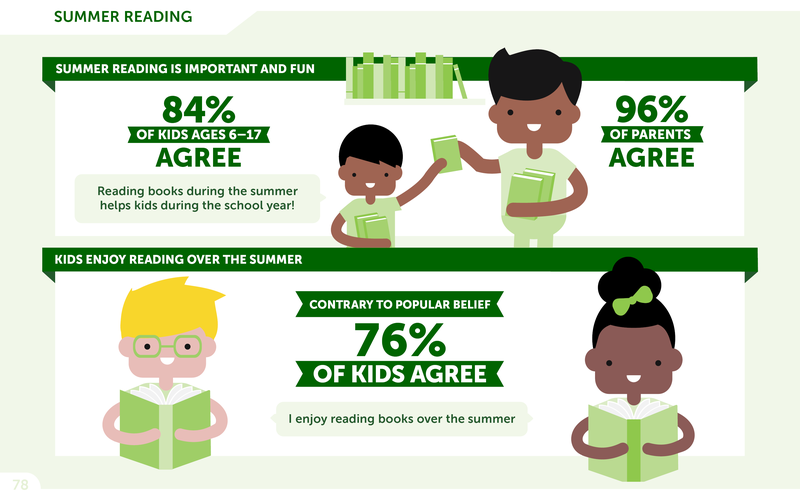 Contrary to popular belief, 76% of kids agree that they enjoy reading books over the summer. Have you heard of the summer slide? Summer slide is the loss of skills during the time when students are not in school. Only 31% of parents have heard about the summer slide. Parents say that teachers and schools are the #1 source of information on the summer slide. Parents of kids from ages 6-17 were asked what they thought were the top ways to ensure that their child reads over the summer. 58% of parents of children ages 6-11, and 49% of parents of children ages 12-17 agree that taking their child to the library is a top way to ensure they read over the summer. 49% of parents of children ages 6-11, and 39% of parents of children ages 12-17 agree that taking books on trips and vacations is a top way to ensure they read over the summer. 44% of parents of children ages 6-11, and 32% of parents of children ages 12-17 agree that getting books from school book clubs or book fairs is a top way to ensure they read over the summer. 38% of parents of children ages 6-11, and 38% of parents of children ages 12-17 agree that finding books series so there are multiple books to read is a top way to ensure they read over the summer. 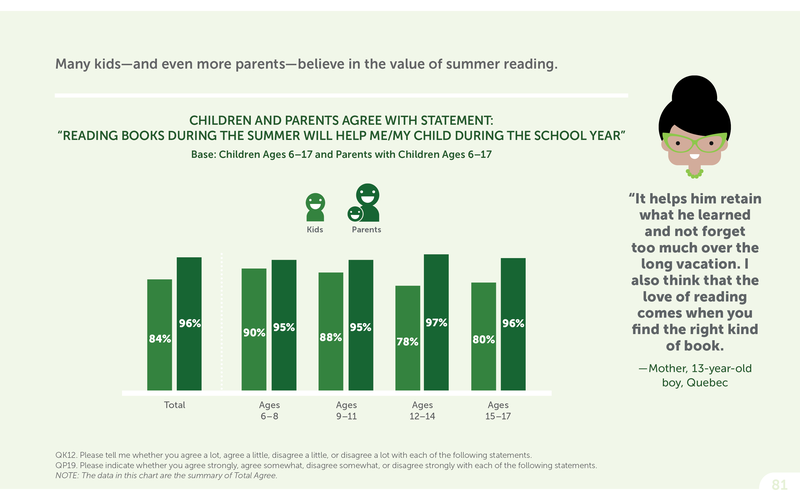 38% of parents of children ages 6-11, and 27% of parents of children ages 12-17 agree that building reading into their child's daily summer schedule is a top way to ensure they read over the summer. 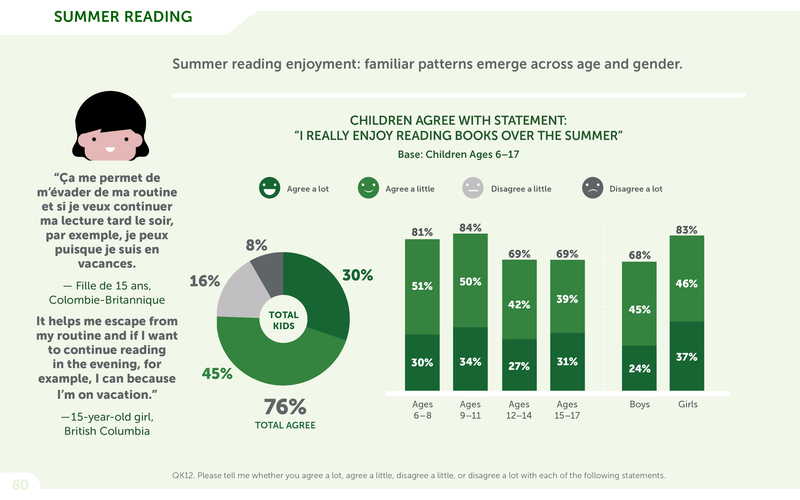 Summer reading enjoyment: familiar patterns emerge across age and gender. A base of children of ages 6-17 were asked whether they agreed with the statement: "I really enjoy reading books over the summer". A total of 76% of all kids asked agreed with the statement to some degree, with 30% saying that they agreed a lot, 45% saying that they agreed a little, 16% saying that they disagreed a little, and 8% saying that they disagreed a lot. Of children from ages 6-8 asked, 30% said that they agreed a lot, and 51% said that they agreed a little, meaning that a total of 81% agreed with the statement to some degree. Of children from ages 9-11 asked, 34% said that they agreed a lot, and 50% said that they agreed a little, meaning that a total of 84% agreed with the statement to some degree. Of children from ages 12-14 asked, 27% said that they agreed a lot, and 42% said that they agreed a little, meaning that a total of 69% agreed with the statement to some degree. Of children from ages 12-14 asked, 31% said that they agreed a lot, and 39% said that they agreed a little, meaning that a total of 69% agreed with the statement to some degree. For boys of all ages asked, 24% said that they agreed a lot, and 45% said that they agreed a little, meaning that a total of 68% agreed with the statement to some degree. For girls of all ages asked, 37% said that they agreed a lot, and 46% said that they agreed a little, meaning that a total of 83% agreed with the statement to some degree. "Ca me permet de m'evader de ma routine et si je veux continuer ma lecture tard le soir, par exemple, je peux puisque je suis en vacances. "- Fille de 15 ans, Columbie-Britannique. An open ended response from a 15-year-old girl from British Columbia on reading over the summer: "It helps me escape from my routine and if I want to continue reading in the evening, for example, I can because I'm on vacation." Many kids-and even more parents-believe in the value of summer reading. A base of children of ages 6-17, and parents of children ages 6-17 were asked whether they agreed with the statement: "Reading books during the summer will help me/my child during the school year". In total, 84% of all kids asked, and 96% of all parents asked agreed with the statement. For children of ages 6-8, and for parents of children of the same ages, 90% of kids and 95% of parents agreed with the statement. For children of ages 9-11, and for parents of children of the same ages, 88% of kids and 95% of parents agreed with the statement. For children of ages 12-14, and for parents of children of the same ages, 78% of kids and 97% of parents agreed with the statement. For children of ages 12-14, and for parents of children of the same ages, 80% of kids and 96% of parents agreed with the statement. An open ended response from a Mother of 13-year-old boy from Quebec on reading over the summer: "It helps him retain what he learned and not forget too much over the long vacation. I also think that the love of reading comes when you find the right kind of book." And yet, just over half of kids will read during the summer without prompting, while an additional third will read if parents work at it. A base of parents of children from ages 6-17 were asked to describe the summer reading experiences they had with their child. In total, 54% of parents said that their child reads books willingly over the summer with no prompting from them, 34% of parents said that they have to work hard to get their child to read books over the summer, 8% said that no matter what they do, they can't get their child to read books over the summer, and 3% said that making their child read over the summer is not important to them. For parents of boys, 46% said that their child reads books willingly over the summer with no prompting from them, 41% of parents said that they have to work hard to get their child to read books over the summer, 9% said that no matter what they do, they can't get their child to read books over the summer, and 3% said that making their child read over the summer is not important to them. For parents of girls, 62% said that their child reads books willingly over the summer with no prompting from them, 28% of parents said that they have to work hard to get their child to read books over the summer, 7% said that no matter what they do, they can't get their child to read books over the summer, and 3% said that making their child read over the summer is not important to them. For parents of children who are frequent readers, 73% said that their child reads books willingly over the summer with no prompting from them, 20% of parents said that they have to work hard to get their child to read books over the summer, 5% said that no matter what they do, they can't get their child to read books over the summer, and 2% said that making their child read over the summer is not important to them. For parents of children who are moderately frequent readers, 53% said that their child reads books willingly over the summer with no prompting from them, 40% of parents said that they have to work hard to get their child to read books over the summer, 4% said that no matter what they do, they can't get their child to read books over the summer, and 3% said that making their child read over the summer is not important to them. For parents of children who are infrequent readers, 17% said that their child reads books willingly over the summer with no prompting from them, 46% of parents said that they have to work hard to get their child to read books over the summer, 29% said that no matter what they do, they can't get their child to read books over the summer, and 8% said that making their child read over the summer is not important to them. An open ended question from a Father of a 13-year-old girl from British Columbia on reading over the summer: "Reading should be seen as fun, and we read as a family at least three to four times a week to promote this. In the summer we usually try for two to three times per week." Parents' summer reading strategies vary by age of child. 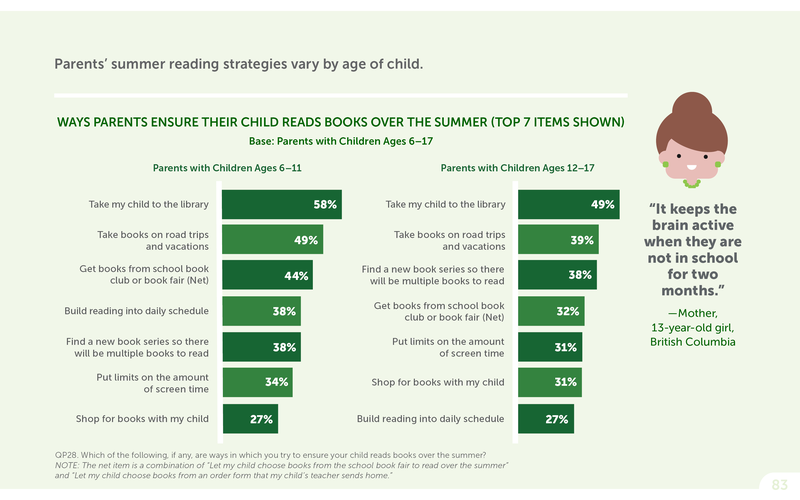 A base of parents of children from ages 6-17 were asked about which strategies, if any, they use to ensure that their child reads books over the summer. When asked if they take their children to the library to ensure summer reading, 58% of parents of children ages 6-11 said that they did, whereas 49% of parents of children from ages 12-17 said that they did. When asked if they take books on road trips and vacations to ensure summer reading, 49% of parents of children ages 6-11 said that they did, whereas 39% of parents of children from ages 12-17 said that they did. When asked if they get books from school book clubs or books fairs to ensure summer reading, 44% of parents of children ages 6-11 said that they did, whereas 38% of parents of children from ages 12-17 said that they did. 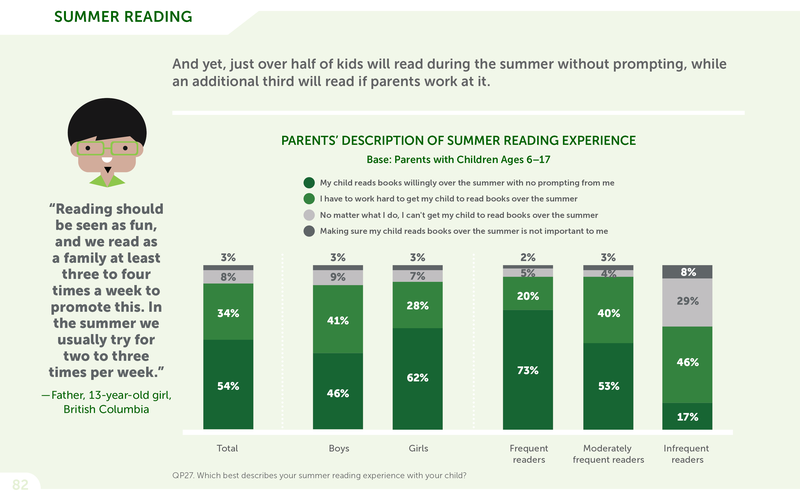 When asked if they build reading into the daily schedule of their kids to ensure summer reading, 38% of parents of children ages 6-11 said that they did, whereas 32% of parents of children from ages 12-17 said that they did. When asked if they find new book series so there will be multiple books to read to ensure summer reading, 38% of parents of children ages 6-11 said that they did, whereas 31% of parents of children from ages 12-17 said that they did. When asked if they put limits on the amount of screen-time their child is allowed to ensure summer reading, 34% of parents of children ages 6-11 said that they did, whereas 31% of parents of children from ages 12-17 said that they did. When asked if they shop with books online with their child to ensure summer reading, 27% of parents of children ages 6-11 said that they did, whereas 27% of parents of children from ages 12-17 said that they did. An open ended response from a Mother of a 13-year-old girl from British Columbia on reading over the summer: "It keeps the brain active when they are not in school for two months." One in three parents with children ages 6-17 have heard of the summer slide. A base of parents of children from ages 6-17 were asked whether they had heard of or received andy advice pertaining to the summer slide. In all, 31% of parents said that they had heard of or received advice about the summer slide, 53% said they had not, and 15% were unsure or did not remember. 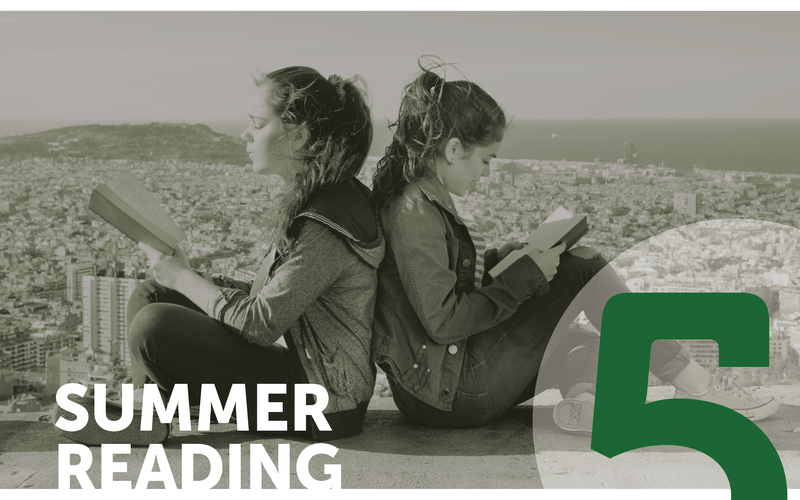 An open ended response from a Mother of a 16-year-old girl from Alberta about reading over the summer: "Reading over the summer keeps the brain sharp." Teachers and schools are the number one source for information on the summer slide. A base of parents of children from ages 6-17 who had heard about the summer slide were asked about which sources they got their information from on the topic. 53% of parents said they got information about the summer slide from their child's teacher or school. 38% of parents said they got information about the summer slide from parenting magazines, websites, blogs or books. 33% of parents said they got information about the summer slide from news or other media. 28% of parents said they got information about the summer slide from friends or family. 20% of parents said they got information about the summer slide from their local library. 14% of parents said they got information about the summer slide from other sources. An open ended response from a Father of a 10-year-old boy from Ontario on reading over the summer: "Reading over the summer months keeps the learning momentum going from previous school year."